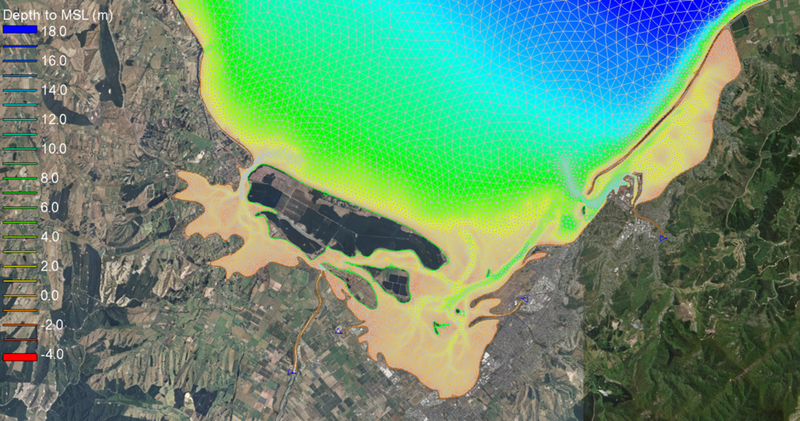 MetOcean Solutions has recently operationalised a high resolution hydrodynamic model for Tasman and Golden Bay, New Zealand. 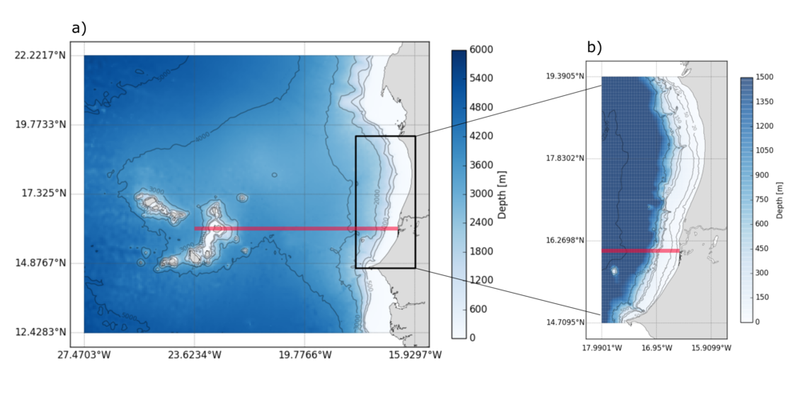 The underlying forecast data is produced by a state-of-the-art unstructured hydrodynamic model (SCHISM), with offshore 3D boundary conditions sourced from a 3-km ROMS implementation of the central NZ region. This new capability was developed as part of the Sustainable Seas Project together with the Cawthron Institute and NIWA and will provide valuable information necessary to manage contamination risk in the aquaculture industry and beach water quality forecasts relevant to regional councils and recreational beach users. General Manager MetOcean Solutions Dr Brett Beamsley says MetOcean Solutions’ science team has many years of experience with the SCHISM model (previously SELFE); applied primarily in high value consultancy services or research projects, with the unstructured domain capability key to representing complex nearshore bathymetries in a computationally efficient manner. "SCHISM is a valuable addition to our operational hydrodynamic forecast system,” says MetOcean Solutions’ physical oceanographer Phellipe Couto. “It allows our model applications to account for an even better representation of topographic features (e.g. islands, embayments, navigation channels and tidal inlets) and engineering structures (e.g. ports and breakwaters) that pose critical aspects in the modulation of the hydrodynamic regime surrounding nearshore and coastal waters. “In practical terms, this enable us to resolve multi-scale geophysical processes such as tides, river plume dispersion and storm surge with an extra degree of accuracy and therefore provide better forecast solutions to the end user. “The impact of storm surges on coastal areas has become highly topical particularly in the last year and the rapid deployment of this type of operational modelling infrastructure has the potential to more accurately predict coastal nearshore water levels. SCHISM model grid resolution from approximately 10 m nearshore to 1.5 km offshore. The project ‘Near real-time forecasting using operational oceanographic forecasting of contamination risk to reduce commercial shellfish harvest and beach closures’ is a collaborative effort of experts from the Cawthron Institute, NIWA and MetOcean Solutions. A project to build connected land-river-sea models and provide a timely risk assessment of contamination to beaches and shellfish growing areas. For more information on Sustainable Seas National Science Challenge click here. The SCHISM model for Tasman and Golden Bay is freely available at MetOceanView. Map layer of SCHISM surface current forecast. Image from MetOceanView. Map layer of SCHISM surface salinity forecast. Image from MetOceanView. MetOcean Solutions recently completed the development of high-resolution wave and hydrodynamic hindcast models offshore Senegal and Mauritania, West Africa. The Simulating WAves Nearshore (SWAN) model was used to resolve the wave climate and the Regional Ocean Modeling System (ROMS) was applied to simulate the hydrodynamic circulation. The technique implemented is known as ‘dynamical downscaling’, using information from large scale global models to drive regional/nearshore models at much higher resolution. All models were carefully calibrated with measured data from several current meters and wave buoys that were made available. The SWAN model simulates the growth, refraction and decay of each frequency-direction component of the complete sea state, providing a realistic description of the wave field as it changes in time and space. Full spectral boundaries were prescribe from the MetOcean Solutions’ global wave model to the 5-km SWAN domain. The latter was used to force the boundaries of the 1-km SWAN domain, which in turn was applied to the boundaries of the high-resolution 100-m SWAN domain (Figure 1). All model nests were simulated in series over 39 years (1979 to 2017). 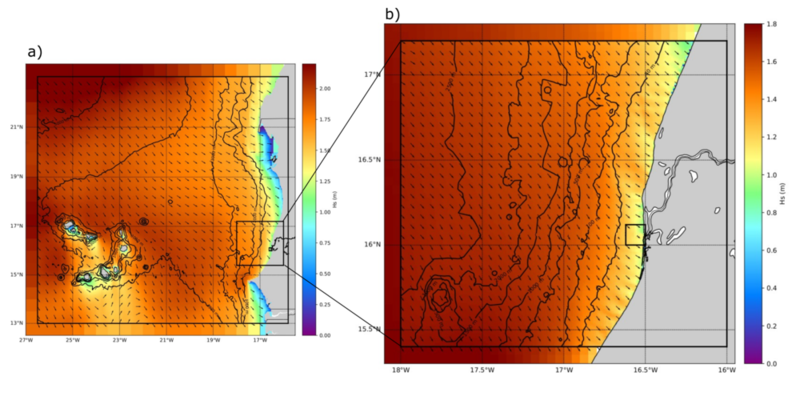 Figure 1: Snapshot of modelled significant wave height from the 5-km resolution SWAN parent nest off the Senegal/Mauritania coasts, delimited by the outer rectangle on (a). Extents of the 1-km resolution child nest are represented by the outer and inner rectangles on (a) and (b), respectively. Extents of the 100-m resolution child nest are represented by the inner rectangle on (b). This ROMS model is an open source state of the art ocean model which has been used widely in the scientific community and industry for a range of ocean basin, regional and coastal scales. ROMS has a curvilinear horizontal coordinate system and solves the hydrostatic, primitive equations subject to a free-surface condition. Its terrain-following vertical coordinate system results in accurate modelling of areas of variable bathymetry, allowing the vertical resolution to be inversely proportional to the local depth. Two ROMS nests were defined with horizontal resolutions of approximately 6 km and 2 km for the regional and local model grid domains, respectively, as shown in Figure 2. Figure 2: ROMS (a) regional (6 km) and (b) local (2km) computational model grids. The red lines illustrate the transect corresponding to the vertical sigma grid structures provided in the following figure. Note the bathymetry is represented with distinct colorbars in (a) and (b). The terrain-following grid configuration consisted of 30 and 23 vertical levels with increased resolution at surface and near-bottom to better represent the boundary layers (Figure 3). The model was produced over 25 years (1993 to 2017), delivering 3-dimensional current, water temperature and salinity and sea surface elevation data. Figure 3: Representation of the 30 vertical sigma levels of the regional grid domain over a cross-shelf transect along the latitude of 16.064०N. Hindcast datasets offer key baseline information for project scoping, offshore and coastal design, project planning and environmental impact assessments. For further information about MetOcean Solutions hindcast datasets, please contact hindcast@metocean.co.nz. MetOcean Solutions recently completed a 26-year hindcast detailing currents and water elevation of the Hauraki Gulf. The hindcast was created using a 2-dimensional Regional Ocean Modeling System (ROMS) model run at 250 m resolution, delivering detailed depth-averaged currents and water elevation data from 1989 to 2016. Oceanographer Phellipe Couto carried out the modelling. He explains: “The model resolves barotropic tides - the depth-averaged velocity component of the tide - as well as water levels. The Hauraki Gulf is subject to storm surges, which are driven by wind setup and atmospheric pressure. Low-pressure systems sweeping across New Zealand result in surge, which can act to amplify the tides, causing very low or high water levels." Snapshots of modelled atmospheric and oceanic fields during a meteorological event. Upper panels show mean sea level pressure contours and non-tidal sea surface elevation provided by the New Zealand-wide grid. The animation at the bottom illustrates the depth-averaged current flow field inside the Hauraki Gulf reproduced in the high-resolution grid. The hindcast data was validated against water elevation data from a tide gauge at Tiritiri Matangi Island. For further information about the Hauraki Gulf ROMS hindcast, please contact enquiries@metocean.co.nz. Hindcast wave model data are now available for the Kaikoura region. The data, which includes two high-resolution nested domains around the Kaikoura Peninsula and Clarence (regions where active coastal construction is taking place) were generated by dynamically downscaling waves from MetOcean Solutions’ global wave model using a series of Simulating WAves Nearshore (SWAN) model nests. Snapshot of significant wave height (Hs) and peak wave directions for the SWAN domains defined for Kaikoura. Inserts show the Clarence (right) and Kaikoura Peninsula (bottom) nests. “Much of the rail and SH1 roading network north of of Kaikoura historically went very close to the sea and as a result were often closed due to waves washing over the narrow foreshore. Design tolerances for reconstruction of these networks will require an understanding of the likely impacts of large waves, including storm return periods and maximum expected wave heights. In the absence of measured data, this understanding can only be achieved through long period hindcasts. Understanding the dynamics of estuaries is important when setting minimum flow levels for the rivers flowing into them. Model domain showing depth relative to mean sea level in metres. When Otago Regional Council consulted with local communities about possible minimum flows for the Waikouaiti River, interest groups voiced concern about what potential changes in freshwater inflow would do to the health of the estuary. So Rachel Ozanne, the Council water quality scientist, contracted MetOcean Solutions to investigate the natural variations in freshwater input to help council explore the potential impacts of flow reduction on estuary processes and ecology. The council was particularly interested in assessing the difference that the minimum flow levels would make to the summer flows, when the natural riverine input into the estuary is at its lowest. The first step in setting up a hydrodynamic model is to get accurate bathymetry. A survey was carried out by Hunter Hydrographics and the data were combined with council LiDAR and chart data from LINZ. A finite-element (triangular mesh) numerical model domain was set up, with 5 m resolution inside the estuary, reducing to 200 m offshore. The SCHISM model was established and validated with measurements of water properties, water levels and currents made during a targeted field campaign undertaken by the Cawthron Institute. Rachel feels that the modelling confirmed council suspicion that the natural variability in the area exceeds potential changes caused by varying the freshwater input. A eulerian tracer method was used to examine the dilution of fresh water within the estuary, and these simulations clearly showed that the rate of flushing varies for specific areas. Which areas are prone to siltation? 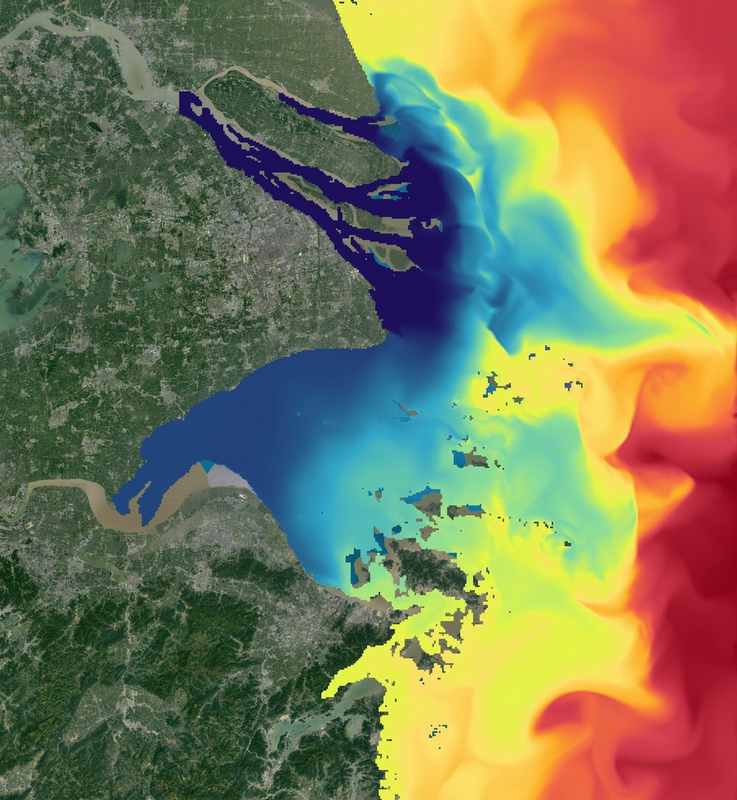 The model was also used to examine sediment transport potential within the estuary. “When current flows exceed a threshold value, the sediments are mobilised and transported along in suspension,” adds Brett. “The sediments settle out when the current velocity drops. The modelling showed that even the smaller channels within Waikouaiti Estuary have flows that can entrain silts and sands for considerable periods of time on each tide. However some of the adjacent shallow intertidal flats do not, so these areas are susceptible to siltation. The number of hours the estuary bed is wetted over the tidal cycle. Another aspect that the council was interested in was assessing how large the intertidal area is at different stages of the tide, and at the spring and neap tides. “Exposure to air is a critical component determining which species live where in the estuary, and which species prey on them” states Rachel. “Areas that are rarely inundated are susceptible to sedimentation, and maps like these help us understand the ecology and potential future changes that might affect the biological communities. Making the data and model freely available was important to Otago Regional Council. For further information on Otago Regional Council, see their website. For more information on MetOcean Solutions’ coastal service, click here or view a pdf here. Cartridges released from the Waitara River potentially spread far. An unusual query from Taranaki Regional Council resulted in an interesting unravelling of the fate of plastic waste washing into the sea. In August 2016, Dr Emily Roberts, Taranaki Regional Council’s Marine Ecologist, approached MetOcean Solutions to ask for help with some marine detective work. Emily is involved with Project Hotspot, a Taranaki based pilot project that is using citizen science to support the conservation of threatened and iconic species. As part of the project, Council worked with Oakura School and Highlands Intermediate to clean up Taranaki beaches. The children were puzzled to find dozens of plastic wads from shotgun cartridges washing up on beaches around Taranaki, including within the environmentally sensitive Tapuae Marine Reserve. They wanted help determining likely sources of the cartridges, and who better to answer this than New Plymouth’s resident oceanographers. Emily discussed the case with Allen Stancliff, the Taranaki Fish & Game Council Field Officer. He suspected that the plastic wads came from the Manganui River (which flows into the Waitara River), where an annual club clay bird shoot event is held. The shoot has grown in popularity over the years, attracting about 200 shooters in recent years. As some of the traps are located on the riverbank, the plastic wads could easily have ended up in the river. Newer ammunition uses fibre wads, but up until 2014 the ammunition used had plastic wads. If Allen was right, thousands of plastic wads could have been washed down the Waitara River over the years. Allen also thought that some plastic wads may originate from gamebird hunters shooting ducks along streams and rivers throughout Taranaki. These hunters are required to use steel shot (rather than lead, which is toxic) and at present the only suitable wads are plastic, but he doubted that this was a significant source. Some of the plastic wads found by Oakura School and Highlands Intermediate. Emily asked MetOcean Solutions to help trace the likely source of the plastic wads. “There’s a number of reasons why stuff washes ashore in certain places,” says Mariana Horigome, the oceanographer working on the project. “The wind and currents are the drivers, but the coastal aspect and shoreline profile also has to be right for objects such as the plastic wads to beach and not get refloated on the next tide." Mariana met up with Emily who pinpointed the locations where the higher concentrations of cartridges were noticed, and with Allen who explained the potential sources. To investigate whether the Waitara River could be the source of the shotgun cartridges, Mariana ran the MetOceanTrack modelling tool, a marine particle tracing software developed by MetOcean Solutions. When the model was set to release particles from the Waitara River they spread widely to locations both north and south of New Plymouth, nicely replicating where the wads had been found. Emily was also keen to determine the source of plastic parking tickets that had been found at the beach cleanup. A MetOceanTrack run showed that the location of the tickets recovered was consistent with them entering the water in New Plymouth City, thus making local beach-goers the likely culprits. The model runs indicated that over time both the cartridges and the parking tickets could potentially spread very far from the source, with some particles ending up north of Mokau. "It was great to get some help determining where the plastic came from," says Emily. "The modelling confirmed our suspicions and we can now take action to minimise the waste entering rivers and the marine environment." For more information about the findings of project Hotspot, click here. At the upcoming New Zealand Coastal Society Conference in Dunedin Dr Brett Beamsley will present recent work from a project with Tasman District Council. The project was designed to help the council assess coastal hazard risks due to inundation and coastal flooding over the coming 100 years. Normally, coastal flooding risks are calculated using a combination of predicted storm tide and sea level rise. However, this technique produces overly conservative estimates in estuarine environments where the non-linear nature of tidal propagation affects inundation levels. The study quantified the likely inundation within the Moturere Estuary, a complex inlet which includes a barrier spit. A numerical model was set up for the site and a combination of ‘worst-case’ water levels were run over several tidal cycles to examine the non-linear propagation of the open coast water levels into the inlet, their effect on inundation levels, and the effect of sequential high-stands on water levels. The findings suggest that because of the tidal wave lag within estuaries the actual inundation extents will likely be significantly different than those predicted if simplistically assuming that land lower than or equal to the storm surge level will become inundated. If the storm surge event spans multiple tidal cycles, or multiple storm surge events are predicted to occur in quick succession, inundation extents are likely to increase significantly. Inundation levels for a 3.5 m combined Sea Level Rise + Storm Tide + Mean High Water Springs for the first high-tide stand (left), a high-tide stand 6-days later (centre) and assuming all land sub 3.5 m becomes inundated (right). The conference is held in Dunedin 16-18 November and has as its theme 'He waka eke noa - Linking science, engineering, management and community'. 'He waka eke noa' is a Maori proverb which means 'We are all in this boat together'. MetOcean Solutions, the Cawthron Institute and NIWA join forces in a project to map and forecast water quality. The project, which is funded as part of the Sustainable Seas National Science Challenge, aims to use oceanographic forecasting to produce forecast charts of expected water quality levels in Tasman and Golden bays, New Zealand. "The idea is to create forecast charts and site specific forecasts that councils, boaties and marine farmers can check, similar to a weather map," explains MetOcean Solutions Project Director Dr Brett Beamsley. "It will show the expected distribution patterns of river plumes formed after heavy rainfall, highlighting their paths once they enter the coastal marine area and become influenced by coastal circulation caused by wind and tides." Rivers often carry contaminants such as sediments and faecal coliforms and the tool will include information about the predicted risk of bacterial contamination in the coastal receiving environment. "The maps will provide helpful information for stakeholders interested in coastal water quality, such as councils tasked with managing beach closures and the shellfish aquaculture industry who cannot harvest until the water quality is sufficiently good," says Dr Beamsley. Currently, water quality in the bays is estimated through the monitoring of river flow rates only. It is hoped that the research will provide higher resolution data on the exact flow patterns of river plumes in the coastal environment, thus allowing more accurate and responsive management of activities sensitive to water quality. The project is one of the eight scientific research projects that have recently received funding as part of the Sustainable Seas National Science Challenge. The challenge aims to enhance the use of New Zealand's vast marine resources, while ensuring the environment is used wisely for future sustainability. The water quality maps will help shellfish farmers establish when water quality is good enough to harvest stock. Taranaki Regional Council has proposed a national surfing reserve for the Taranaki coastline in their draft coastal plan. The proposal covers the coastline from Cape Egmont to Okato and aims to protect the region's renowned surf breaks from anything that might adversely impact the waves. The proposed reserve, the first of its kind in New Zealand, was proposed to the council in May by Dr Peter McComb during the presentation of a regional surf assessment report prepared by MetOcean Solutions. "It's great to see our council showing leadership. Surfing is important for the local communities and economy, and establishing a reserve will afford this unique density of quality surf breaks the protection they deserve," he says. The proposed coastal plan will be going through consultation for the next year. Taranaki Region already has four nationally significant surf breaks (Waiwhakaiho, Stent Road, Backdoor Stent and Farmhouse Stent), and the proposed reserve will ensure that the wider coastline is considered as important as those breaks. For further information about the proposed reserve, see a recent article on stuff.co.nz or view the draft Taranaki Regional Coastal Plan. The proposed reserve will protect the Taranaki Region's surf breaks.